The faeces of large herbivores include viable seeds of many plant species. With dung decomposition, some seeds migrate into the soil and influence seed bank build-up. However, only a few papers report evidence of this process, and only from grasslands. In forest studies, this subject has so far been neglected. Therefore, I ask in this paper whether seeds present in the dung of European bison migrate to the forest soil seed bank and influence its build-up. I sampled soil from underneath European bison dung pats and from surrounding areas (control samples). Samples were divided into shallow (0–5 cm) and deep (5–10 cm) series. Soil seed bank content was studied in the greenhouse for 2 years. The shallow seed bank under dung pats was characterized by the highest species richness (49 species) and seed density (>2,000 m−2). Urtica dioica, Juncus effusus and Carex remota showed a demonstrable increase in seed density in the shallow seed bank underneath dung. Three years after dung deposition, seeds of endozoochoric origin influenced the soil seed bank of coniferous forest. U. dioica, J. effusus, C. remota and other species of deciduous forests and grasslands (Agrostis capillaris, Milium effusum, Polygonum hydropiper, Polygonum mite, Scrophularia nodosa, Stachys sylvatica, Veronica chamaedrys) caused an increase in seed density (by 61 %) and species richness (by 33 %) of the shallow soil seed bank underneath dung in comparison with the control soil seed bank. The online version of this article (doi: 10.1007/s10342-013-0683-4) contains supplementary material, which is available to authorized users. The soil seed bank is defined as a pool of seeds with germinating potential present in the soil. It is also a type of ‘plant community memory’, storing past events (Harper 1977). Classical studies on soil seed banks concentrate mainly on their longevity, richness and diversity in relation to aboveground vegetation in early or late successional communities within almost all kinds of ecosystems (e.g. Bossuyt and Hermy 2001; Hopfensperger 2007). In most seed bank studies, animals are taken into consideration only as factors causing seed mortality (e.g. Leck et al. 1989; Brown and Venable 1991; Thompson et al. 1997; Hulme 1998), seed burial (Vander Wall 1993) or vegetation disturbances allowing the breaking of seed dormancy (Jankowska-Błaszczuk and Grubb 1997). It needs to be emphasized that the dung of large herbivores contains vast numbers of viable seeds of many vascular plant species (e.g. Eycott et al. 2007; Pakeman and Small 2009; Törn et al. 2010). The process of endozoochorous seed dispersal is well described for domestic animals: sheep, horse and cattle (e.g. Bruun and Poschlod 2006; Cosyns et al. 2006; Gower 2008; Pakeman and Small 2009; D’hondt and Hoffmann 2011) and for some wild species (e.g. Malo et al. 1995; Heinken et al. 2002; Myers et al. 2004; Eycott et al. 2007). The number of plant species dispersed by a single animal species in one ecosystem rarely exceeds one hundred. Most probably this is mainly the result of ecosystem plant diversity, animal food preference, seed output in grazed vegetation and seed mortality while passing through animal gut. The only wild European bovine—the European bison Bison bonasus L.—disperses in Białowieża Forest seeds of 178 vascular plant species (Jaroszewicz et al. 2009). Germination of close to one hundred species was recorded from the dung of European bison in the field, although fewer than 20 of these species flowered and developed fruits (Jaroszewicz et al. 2008; Jaroszewicz and Pirożnikow 2011). Some seeds deposited in bison dung stay viable for at least 3 years in field conditions (Jaroszewicz and Pirożnikow 2011). In the greenhouse, some seedlings germinate even in the seventh growing season after dung collection (Jaroszewicz, unpublished data). These facts suggest that seeds from dung preserve their viability as long as seeds from long-term persistent soil seed banks, sensu Thompson et al. (1997), although dung longevity rarely exceeds 3–6 years (Dai 2000; Jaroszewicz and Pirożnikow 2011). A very limited number of studies have been carried out so far on the subject of the influence of endozoochoric seed dispersal on soil seed bank build-up. All of them were carried out in grassland ecosystems. Malo et al. (1995) and Malo and Suárez (1995) studied the soil seed bank in relation to endozoochoric seed dispersal by rabbit in Mediterranean dehesa and concluded that this dispersal mechanism increases the number of germinable seeds by 30 %, but does not influence the richness and diversity of the soil seed bank. Dai (2000) studied changes in soil seed bank species composition following cattle dung deposition in boreal alvar limestone grassland. He reported that the proportion of species developing transient seed banks decreases, while the proportion of species developing persistent seed banks increases, along with the process of dung decomposition in both the dung and the soil seed banks under the dung. Pakeman et al. (1999) studied the influence of endozoochory by rabbit on soil seed bank build-up in acidic grassland but found a significant effect for only one species: Myosotis discolor Pers. The problem of the influence of endozoochorous seed dispersal on the development of forest seed banks is missing in the literature. This paper therefore aims to extend the existing knowledge on the process of forest soil seed bank build-up. Based on data on the longevity of seeds in bison dung and on Dai (2000), Pakeman et al. (1999) and Malo et al. (1995), I hypothesize that seeds migrating from decomposing bison dung into the soil increase the species richness and the density of germinable seed content of the underlying soil seed bank. Białowieża Forest in north-eastern Poland covers approximately 625 km2 (52°42′–52°59′N; 23°43′–23°56′E) and is isolated by the national border between Poland and Belarus from its larger eastern part (875 km2). It is one of the best preserved pieces of European lowland natural forest. Its central part is protected in Białowieża National Park (BNP), which consists of 6,500 ha of strictly protected area and 4,000 ha of areas protected under less stringent regulation. The forest in the strict reserve was not commercially logged up to the First World War, and the area covered by the national park is said to have had continuity of forest cover since the last glaciation (Faliński 1986). In comparison with other woodlands in Europe, Białowieża Forest is composed of relatively well-preserved forest stands. The mean age of forest stands in the strictly protected area of BNP is approximately 130 years (Sokołowski 2004). The woodstands of the national park are unevenly aged, are composed of many layers and many tree species and are characterized by a complex structure. Close to 50 % of the area is covered by oak–lime–hornbeam mixed deciduous forests, 20 % are deciduous boggy forests built by alder and ash, and another 20 % are coniferous forests. European bison are present throughout the forest. They became extinct in the wild in 1919 and were reintroduced into Białowieża Forest in 1952. There are approximately 490 individuals roaming in the Polish part of the forest. Bison use of habitats varies according to season. They prefer to feed in deciduous forests during spring and mixed coniferous forests during early summer (June and July). The end of summer brings similar penetration of both forest types, and the proportion of deciduous woods increases with the advance of autumn (Krasińska et al. 1987; Daleszczyk et al. 2007). The study plot (1 ha) was located in a habitat of mesotrophic subcontinental pine-spruce forest. Its woodstand consisted of Norway spruce Picea abies (L.) H. Karst. and Scots pine Pinus sylvestris L., with some admixture of birch Betula pendula Roth. and B. pubescens Ehrh. Most of the spruce trees on the plot had been killed by spruce bark beetle Ips typographus L. and downed a few years before the study. I selected this part of the subcontinental pine-spruce forest to carry out the research on account of its being a species-poor yet characteristic type of vegetation. The sparse and species-poor plant cover of subcontinental coniferous forest made for easy classification of seedling germinating from soil seed banks for those of local and of not-local origin. Very precise (grid 10 m × 10 m) plant species distribution maps of the area were published by Faliński and Mułenko (1997). Importantly, owing to forest stand disintegration, the site became intensively used by bison, resulting in a high density of bison faeces (over 120 pats ha−1 in 2006), which were monitored for seedling emergence during the years 2006–2008 (Jaroszewicz et al. 2008). Out of 114 dung pats of European bison in which plant germination and establishment had been monitored (see Jaroszewicz et al. 2008), I selected for the needs of this study 41 three-year-old dung pats of European bison. They were chosen for their clearly defined edges, allowing for easy estimation of the area covered by faeces in the past. In May 2009, remnants of the selected faeces and the organic (litter) layer were removed from the top of the soil. These faeces were in an advanced phase of decomposition, allowing seeds to migrate to the soil underneath. According to Jaroszewicz and Pirożnikow (2011), an average bison pat decomposes in coniferous forest in 26.6–30.5 months. Soil cores (diameter 3.6 cm × depth 10 cm) were collected from the whole area underneath the selected bison pats. Each core was divided into two subsamples according to the depth of the origin: 0–5 cm (called hereafter S0–5) and 5–10 cm (called hereafter S5–10). The subsamples collected under the same pat from the same depth were poured together, constituting in effect a mixed sample, with the size depending on dung pat area. This pattern of sampling caused unevenness of sample sizes, with the total area of samples covering 0.61 m2 and a mean sample of 0.015 m2 ± 0.006 (SD) for series S0–5 and S5–10. The control samples were collected following a similar procedure, with 20 cores taken at approximately regular distances from each other within the circumference of the circle at a radius of 1 m from the centre of the pat (Fig. 1). The control subsample series are called hereafter C0–5 (0–5 cm depth) and C5–10 (5–10 cm depth). Each C0–5 and C5–10 sample of soil was 0.02 m2 in size. I removed plant fragments and stones from each soil sample, mixed the sample thoroughly and placed it in a container (18 cm × 18 cm × 9 cm). The species composition and density of the seed bank were determined using the seedling emergence method. The containers were kept in an unheated greenhouse and left there over winter. Seedling emergence was observed over two vegetation seasons (from June 2009 until the end of July 2011). When necessary, samples were watered with demineralized water. After identification and counting, seedlings were removed, and then the soil in the containers was mixed thoroughly to enable the germination of more deeply buried diaspores. The plants which were not determined at the seedling phase were replanted into pots and kept until flowering/fruiting. I used the genus name for those seedlings that could only be identified at the genus level (e.g. Epilobium spp., Juncus spp., Rumex spp.) and considered them as a ‘species’ in the data analysis. Plant nomenclature in this paper follows Mirek et al. (2002). I assessed the habitat of origin and dispersal mechanism for each plant species. The habitat associations were classified following Matuszkiewicz (2001). Dispersal strategies were classified using a variety of sources (e.g. Hill et al. 2004; Bojňanský and Fargašová 2007; Grime et al. 2007). Floristic similarity and species richness were calculated after reduction in the total area of control samples. The reduction was carried out by random drawing of control samples up to the moment at which the sum of their areas was similar to the total area obtained for S0–5 and S5–10 series (approximately 0.60 m2). Variability among data sets in the mean number of plant species and in the mean number of seeds was tested by the Kruskal–Wallis test (data distribution non-normal). The differences in seed densities between series were tested by the Mann–Whitney pairwise test (data distribution non-normal). To find (dis)similarities in species composition between data series, I used the Jaccard similarity coefficient. I confined statistical analyses to plants identified to species or genus level, since those allocated to higher taxa were of little diagnostic value. The evidence of data series distinction was obtained using principal component analysis (PCA) of the variance–covariance matrix performed on the species composition and seed abundance in individual soil seed bank samples. All analyses were performed using PAST 1.58 software (Hammer et al. 2001). Altogether, 1,843 seedlings comprising 58 plant species emerged in the greenhouse during two vegetation seasons from soil seed bank samples. The number of plant species (49) and the abundance of viable seeds (2,041.1 m−2) recorded for S0–5 were over two times higher than that recorded for corresponding control series C0–5 (22 and 796.7 m−2, respectively). Deep soil series: S5–10 and C5–10, were characterized by similar numbers of species and seed abundance (18 species/245.5 seeds m−2 and 16 species/123.3 seeds m−2, respectively; Table 1). The variability in seed density was significant among samples of all series (Kruskal–Wallis H = 82.75, p < 0.0001). The number of seeds m−2 differed between all series (Mann–Whitney test; p < 0.00008 for all pairwise comparisons) except the deepest studied soil layers S5–10 and C5–10, where the difference was not significant (Mann–Whitney test; p = 0.56). Over half the seeds in both top soil layers (S0–5 and C0–5) were built up of Rubus idaeus (52 and 67 %, respectively). Urtica dioica—a nitrophilous species common in the dung of herbivores—built a considerable proportion (15 %) of seeds in S0–5, while almost absent (0.4 % of seeds) in the control (Appendix A1 in ESM). In deeper layers of soil, the highest numbers of seeds belonged to Calluna vulgaris, a species typical for subcontinental coniferous forest (28 and 59 % of all seeds in S5–10 and C5–10, respectively; Appendix A1 in ESM). The lowest floristic similarity (0.27 < J < 0.28) was recorded for S0–5 compared to all other series (Fig. 2). The similarity between both control series and S5–10 was much higher (Fig. 2). Twelve plant species (excluding Carex sp. and Luzula sp. for very low diagnostic value of these multispecies taxa) were present in three or more studied series, although with very low frequency and abundance in the deepest soil layers, and with V. myrtillus and U. dioica missing in C5–10 (Table 2). Out of these 12 species, Calluna vulgaris, Deschampsia flexuosa, Luzula pilosa and Vaccinium myrtillus are common species of subcontinental coniferous forests, and Rubus idaeus is abundant in regenerating forests. The high abundance of R. idaeus is an effect of the woodstand disturbance which took place before the study started. U. dioica does not belong to components of subcontinental coniferous forest vegetation. It was characterized by very low frequency and abundance in C0–5 and in S5–10 and was missing in C5–10. The highest frequency and abundance of U. dioica was recorded in the S0–5 series (Appendix A1 in ESM; Table 2). Similarly, Carex remota and Juncus effusus, a species of (respectively) wet deciduous forests and wet meadows, had the highest frequency in S0–5 and were several times lower in the rest of the series (Table 2). A large group of 26 species emerged only from the S0–5 soil seed bank (Appendix A1 in ESM), but only seven species of this group were reported by Jaroszewicz et al. (2008), emerging from bison pats at the same study plot, and were not reported from local flora of this patch of pine-spruce forest by Faliński and Mułenko (1997): Agrostis capillaris L., Milium effusum, Polygonum hydropiper L., Polygonum mite Schrank, Scrophularia nodosa, Stachys sylvatica L. and Veronica chamaedrys. Most of them can be considered to originate from eutrophic and moist habitats and increased the species richness of S0–5 by 33 % in comparison with C0–5. The proportion of species adapted to different dispersal syndromes did not differ between the series. The proportion of species originating from different habitats was not different between the series (Appendix A1 in ESM). The principal component analysis (PCA) showed a lack of differences between deep soil series (they overlap in the centre of the plot). Both shallow series were wider spread, showing their dissimilarity and higher variability. The first two principle components explained 94.5 % of the total samples’ diversity (Fig. 3). Axis 1 was highly positively correlated (loading: 0.99) with Rubus idaeus, a species of disturbed forests undergoing regeneration. The presence of this species was the main factor causing the separation of the C0–5 series, and a few samples of the S0–5 series along PC1. Axis 2 was highly negatively correlated (loading: −0.89) with U. dioica, a species of wet deciduous forests, and weaker but still considerably correlated with species of wet meadows: J. effusus and Agrostis canina (loadings −0.28 and −0.26, respectively). Their presence was the main factor causing the separation of the S0–5 series along PC2 (Fig. 3). The study revealed differences in species richness and seed density between the shallow (0–5 cm) soil seed bank under the bison dung pat and the rest of the studied soil seed banks. The PCA showed that the main factors influencing the differentiation of the top soil layer underneath the faeces (S0–5) from the other studied data series were the abundance and frequency of U. dioica, J. effusus and Agrostis canina, plant species which are not typical components of the subcontinental pine-spruce forest vegetation. Their seeds originated probably from bison dung. It is notable that two out of three species causing separation of the S0–5 series along the PC2: U. dioica and J. effusus, are among the five most abundant species emerging from bison dung in greenhouse conditions (Jaroszewicz et al. 2009). U. dioica—a species of eutrophic, nitrogen rich and humid habitats—is the most abundantly emerging species from bison dung, not just in greenhouse conditions (Jaroszewicz et al. 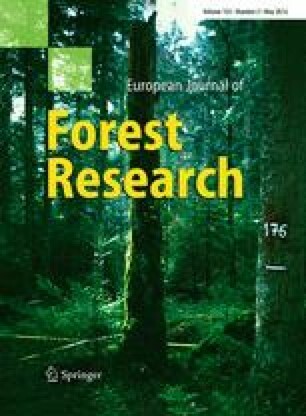 2009) but also in coniferous forest (Jaroszewicz et al. 2008), where habitat conditions are far from the species optimum. The high seed abundance of this species in dung is in line with most of the studies on endozoochory by large herbivores in Europe (e.g. Pakeman et al. 1999; Mouissie et al. 2005; Cosyns et al. 2006; Jaroszewicz et al. 2009; Kuiters and Huiskes 2010). However, its germination in the field and its establishment is rather poor (Pakeman et al. 1998; Bakker and Olff 2003). Three years after dung deposition, three plant species: U. dioica, J. effusus and C. remota, showed a demonstrable increase in seed density in the top layer of the soil seed bank directly under the dung pat. They were characterized by maximum density in the soil seed bank under the bison dung pats (S0–5), but with much lower values or absence in the other soil seed bank series. This was an effect of seed migration to the shallow soil layer from the faecal material deposited on the soil surface. U. dioica does not belong to typical components of the vegetation of coniferous forests, although it is fairly common in all forest soil seed banks, even if it is not recorded in the local vegetation (e.g. Bossuyt and Hermy 2001; Esmailzadeh et al. 2011). My results suggest a possible explanation of this phenomenon by taking into consideration animals as vectors dispersing seeds of this species across ecosystems. Juncus effusus and C. remota are components of the vegetation of wet meadows and deciduous forests (respectively). Their seeds are morphologically not adapted to long distance dispersal (J. effusus) or are poorly adapted to epizoochory (C. remota). They were not recorded emerging on bison pats in the field (Jaroszewicz et al. 2008), and they are also absent from the local vegetation (Faliński and Mułenko 1997). Their germination from bison faeces in greenhouse studies on endozoochory (Jaroszewicz et al. 2009) proves that they are foraged by bison and survive passing through its gut. Most probably, the germination of these two species on bison pats in the field was inhibited by the chemical composition of dung, most probably the too high nitrogen concentration or unsuitable pH (Ocumpaugh et al. 1996). In effect, many of them passed dormant to the soil underneath after the decomposition of faeces and germinated from soil seed bank in the greenhouse. Species composition of the shallow soil seed bank under bison dung pats comprised 49 species, with 26 species being exclusive to it. The species richness of this seed bank was over two times higher than the corresponding control soil seed bank. However, only 10 species out of 26 making the difference were recorded as germinating from bison pats in the field (Jaroszewicz et al. 2008). Three species out of these 10: Pinus sylvestris, Populus tremula and Veronica officinalis, could originate from local seed sources as they are common components of subcontinental pine-spruce forest (Faliński and Mułenko 1997). The rest of the species (most of the components of eutrophic moist habitats): A. capillaris, M. effusum, P. hydropiper, P. mite, S. nodosa, S. sylvatica and V. chamaedrys, with high probability migrated to the seed bank from bison dung deposited on the soil surface. Their presence in the soil seed bank underneath the dung pats corroborates the tested hypothesis, showing the influence of the seeds of endozoochoric origin on soil seed bank species richness build-up. Comparison of the species composition and the seed densities in the studied soil seed banks revealed an increase in the species richness (by 33 %) and of the seed density (by 61 %) in the soil seed bank S0–5. This corresponds well with the 27 % of vegetation that develops on ‘seed free’ soil that was calculated by Pakeman et al. (1999) to emerge from rabbit pellets in grassland. Seed input from bison dung in the present study was approximately two times higher than from rabbit pellets in acidic (33 %; Pakeman et al. 1999) and Mediterranean grasslands (39 %; Malo et al. 1995). This difference was caused most probably by differences in the character of dung deposition between European bison and rabbit. Bison dung pats thickly cover 100 % of the soil surface (the average pat thickness of bison pats was 2.2 cm ± 0.47 (SD); unpublished data), while rabbit pellets are of comparatively low thickness, and they are merely scattered on the soil, not covering its surface densely. This factor, as well as possible differences in seed densities between bison dung and rabbit dung, influenced the reported difference in the seed number deposited per m2. The tested hypothesis that the increase in species richness in the soil seed bank is due to the transfer of seeds from dung is also supported by the fact that only a few species of plants recorded in the control series C0–5 were absent from the deep soil seed bank layers and from vegetation (Faliński and Mułenko 1997), but a considerable number of species present in the S0–5 soil seed bank, and also emerged from bison faeces in the field (Jaroszewicz et al. 2008), were absent from other studied soil seed bank series and from vegetation (Faliński and Mułenko 1997). Deeper soil seed banks (5–10 cm) were not influenced by this process. However, data on the speed of seed migration in the soil is very scarce. It is possible that the period between dung deposition and the sampling of soil seed banks was too short for seeds to reach deeper soil layers, but this aspect of soil seed bank build-up needs further study. Endozoochoric plant dispersal by European bison influences forest soil seed bank build-up. Three years after dung deposition, the effect was noticeable in the shallow (0–5 cm) soil seed bank directly under bison dung pats. This influence was expressed by: (1) seed density in the soil seed bank under bison pats increased by 61 %, mostly by species of non-local origin: for example, U. dioica, J. effusus and C. remota; (2) the species richness of the soil seed bank under bison pats increased by 33 %, by species which are not components of coniferous forests: A. capillaris, M. effusum, P. hydropiper, P. mite, S. nodosa, S. sylvatica and V. chamaedrys; (3) low floristic similarity between the shallow (0–5 cm) soil seed bank under bison pats (S0–5) and all the other studied soil seed banks, in contrast to high floristic similarity between shallow control series C0–5 and both deep (5–10 cm) soil seed banks (S5–10 and C5–10). I would like to thank Alicja Wiktoruk, Ireneusz Smerczyński, Włodzimierz Szpakowicz, Izabela Sondej and Justyna Wiśniewska for technical work in the field, lab and greenhouse. I am also grateful to Małgorzata Błaszczuk-Jankowska, Anna J. Kwiatkowska-Falińska, Ewa Pirożnikow and anonymous reviewers for their help in improving the manuscript. The study was supported from resources earmarked for science by the Polish Ministry of Science and Higher Education in the years 2006–2009 as research project no. 2 P04F 035 30 and 2009–2012 as research project no. N N304 021737.